Sometimes in sport you have to experience the lows to really appreciate the highs. Just ask Graham Onions. When the 30-year-old Durham seamer made his return to the England Test team against West Indies in June, it was all the more special for being the culmination of a 29-month journey during which he required surgery to overcome a stress fracture of the back. Now fully back in the fold and preparing to fight for a place in the side for the four-Test series in India, Onions has been reflecting on a period in which he needed the help of a psychologist to cope with the very real fear that he might never play the game again. "I wouldn't say I'm necessarily the most positive person in the world, so during that time out I found it really hard," he tells BBC Sport. "I had to look at myself and try to believe that I was going to get better." Onions's injury troubles began just when he was hoping to nail down a place in the England Test attack after taking 18 wickets in six matches against Australia and South Africa in 2009 and twice holding firm with the bat at number 11 to salvage draws from the brink of defeat. Picked for the tour of Bangladesh in March, he was bowling in the first net session when he felt a sharp pain in his back and was sent home for treatment. A spasm was later diagnosed as a fracture and Onions embarked on a period of rehabilitation during which he also underwent surgery to repair cartilage in his left knee. His knee recovered fully but his back continued to be problematic and, after exhausting every alternative form of treatment, doctors decided to attempt a career-saving operation. "Nobody wants to go under the knife but it really was the last option - at that stage it was 50-50," recalls Onions. "Once I had the operation I knew I would have no alternative but to work as hard as I possibly could to get in the best shape possible. "And if I worked as hard as possible and still couldn't bowl a ball because of the pain I would have walked away from cricket thinking that at least I tried my hardest. If I was leaving everything to chance I would have regretted it for the rest of my life." It was following the surgery in September 2010 that Onions sunk to his lowest ebb. Struggling to move, grumpy and stripped of his central contract, he watched his England team-mates storm to a first Ashes triumph in Australia since 1987 and found it hard not to feel resentful. "I was pretty much seeing the psychologist every week and that went on for quite a few months either side of the operation." Weeks of physiotherapy and gym work followed as Onions gradually recovered the strength and fitness required to bowl again, and subsequently reclaim his place in the Durham side. He took 50 wickets in 11 Championship matches in 2011 and, after a blistering start to the 2012 campaign, was recalled the England squad for the summer Test series against West Indies. Onions sat out the first two Tests, but the decision to rest Stuart Broad and James Anderson for the third at Edgbaston gave him the chance to resume an England career that had been on hold since January 2010. Bowling with pace and purpose, Onions was comfortably the pick of the England bowers as he took four first-innings wickets to swiftly reaffirm his credentials at the highest level of the game. "Last season was a case of getting back into it and doing some good things, but I always knew this season was going to be the big one in terms of forcing my way back into the England team," he says. "That's what makes the Test against the West Indies so emotional really because from being on the brink of never playing cricket again to playing for your country again was very, very special." Onions did not feature in the three Tests against South Africa that followed, but kept himself firmly in the selectors' minds through his performances for Durham. Indeed, after being released from England duty on the morning of the Lord's Test, he drove to Nottingham, had a quick lunch, put on his Durham whites and took nine wickets and a run-out. Meanwhile, England were on their way to a damaging defeat in a series where rival pacemen Broad, Anderson, Tim Bresnan and Steven Finn often appeared to lack penetration against the Hashim Amla-inspired Proteas. So, with India on the horizon, does Onions feel the door is open? "There's been a lot of talk in the press about potential changes in the side and maybe it's not as settled as people think," he says. "The series against South Africa didn't go to plan. They've got a fantastic batting unit and our bowlers struggled a little bit. "They will probably feel the pressure of the likes of myself breathing down their necks to try to take their places. "If my opportunity comes in the first Test or the fourth, I've got to make sure I'm ready to take it." With five seamers competing for what could be as few as two places in the Test side on spin-friendly pitches, Onions knows he will need to hit top form in the warm-up matches to avoid spending two months as a drinks waiter. 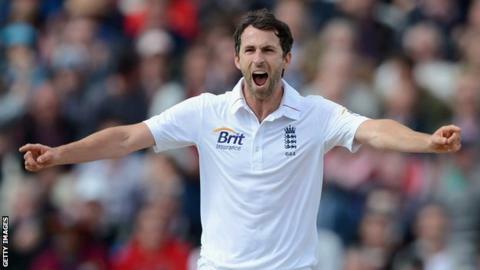 But he also knows that, after what he has been through, he should savour every moment of life as an England cricketer. "I'm just so lucky that the surgery I had went well," he says. "The screw I have in the left-hand side of my back is still there - it's the little bit of scaffolding holding me together."